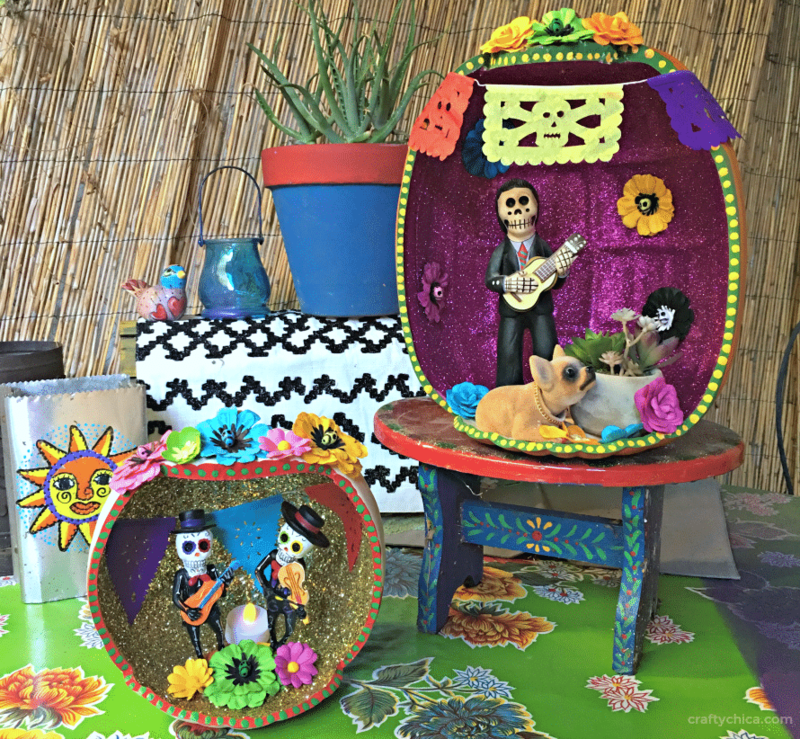 Turn a Foam Pumpkin into a Shadow Box! 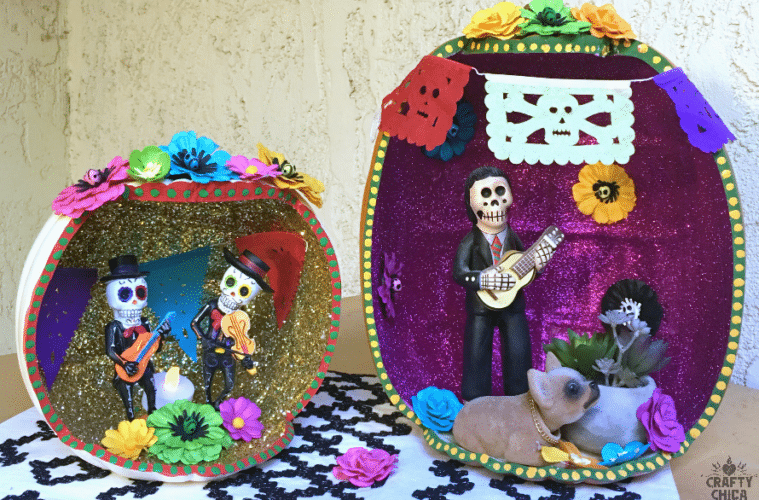 We already have a Dia de Los Muertos ofrenda set up in our house and I wanted new decorations. 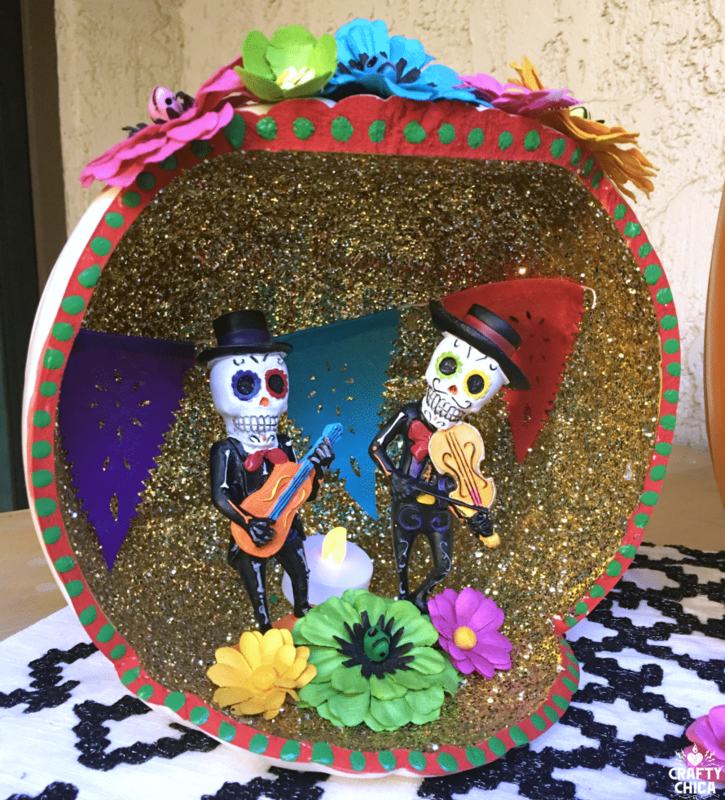 So I made a foam pumpkin shadow box! Oh man, let me tell you – this project was sooooo fun. 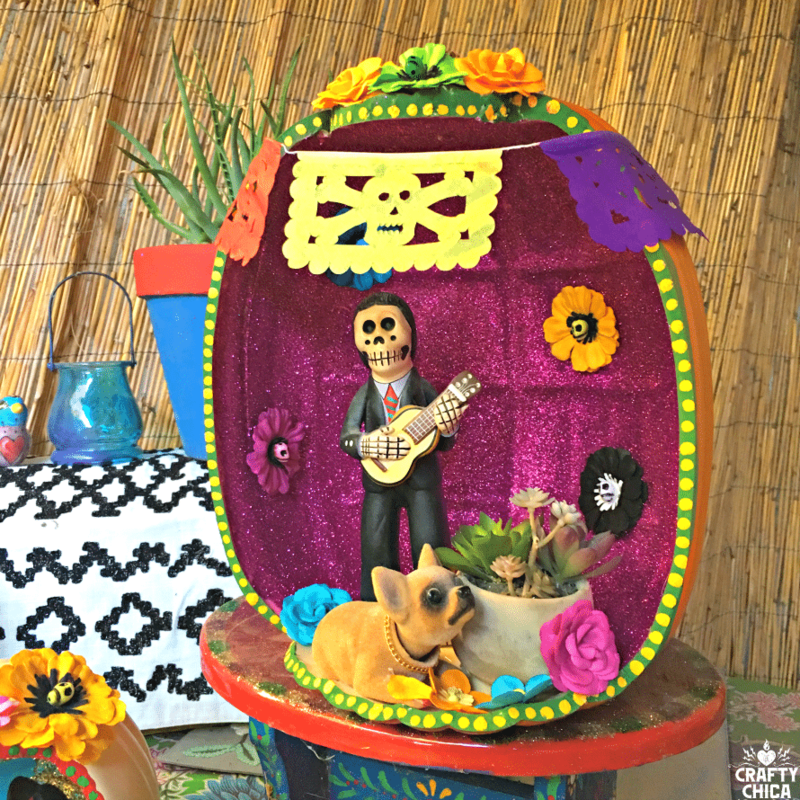 My biggest tip is to make sure your items to put inside will fit inside the pumpkin. I didn’t do that, and I cut my pumpkin and my little statue didn’t fit. I went back to the craft store for a new pumpkin (larger!) and guess what I found? Pumpkins already cut as shadow boxes! It’s ok, I still cut my own version. So there! I think this would be even better on a miniature level! That is going on my to-do list! OK, here is the video tutorial I made for this project! Hot knife or pocket knife (sharp!) – be careful! Draw where you want to cut the hole. Leave enough in the front so your pumpkin won’t fall over backwards. Carefully cut away the hole. 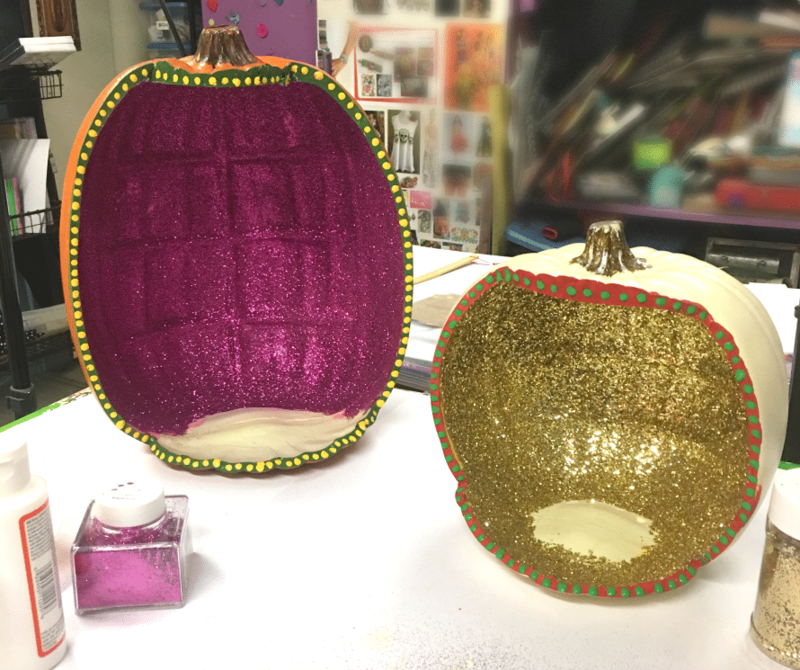 Paint the inside of the pumpkin the same color as the glitter. This will make a nice even opaque coat. 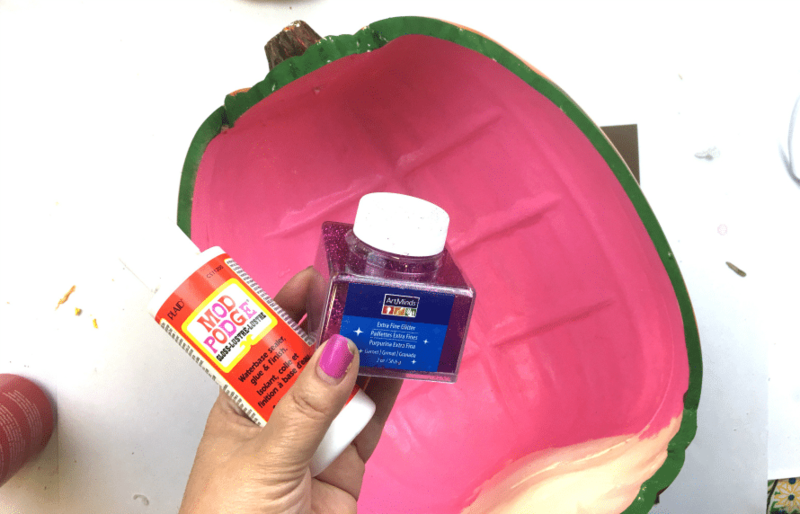 Leave the bottom of the pumpkin unpainted so your items will have a firmer grip to the surface. Once the paint is dry, paint on a coat of decoupage medium and while it is still wet, pour in the glitter. Roll it around so it is evenly covered. then add decorations around the outside edges. Let dry and then use both the extra strength glue and the the hot glue to add your items. The hot glue will hold them in place while the other glue dries. Add your main focal point items and add the flowers all around. Check out the video for the step-by-step process! I feel like this could be a really awesome class to teach, so many possibilities! 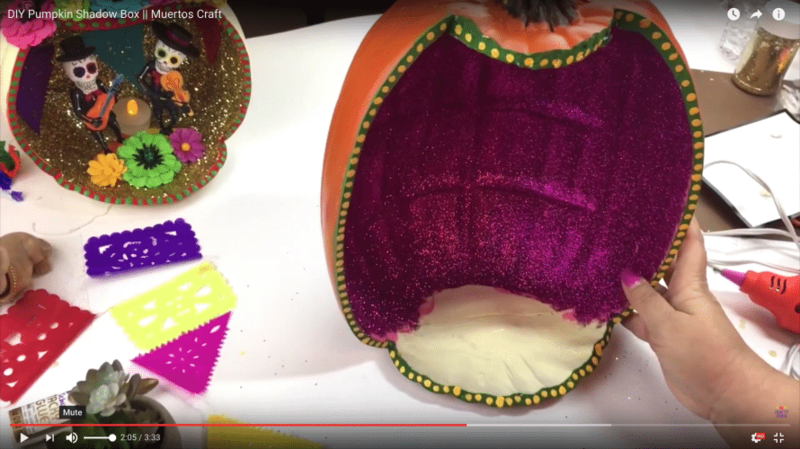 What kind of pumpkin crafts are you making this season? Share in the comments below! Next ArticleMexi-Mediterranean Salad – You will LOVE this! If I were to make one, instead of skeletons I would decorate it with pictures of those that passed over and save the front section and make it a hinged door to close it. Edna, I love that idea! Hi Kathy!!! I Love LOve LOve your page & ideas! So I’m a teacher & would like to know budget wise how much would this run? Like where do I get figurines & trinkets for inside?? The pumpkins are 60% off at michaels, and the flowers you can get from the dollar store. As far as the figures, they were 2.99, 40% off at michaels! too! You can even put a little picture inside if you can use a figurie! I made one. I gave it to my sister. I’m sad. I want it back.